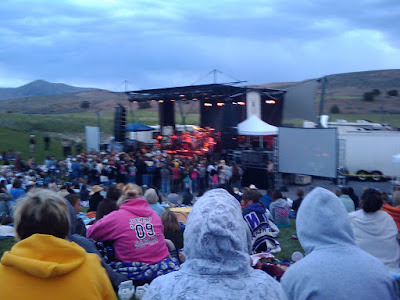 Mike and I went to the Josh Gracin concert two weeks ago and it was so much fun! It was K bulls 99.3 low dough country show to support the Troops. Josh Gracin and Darryl Worley and some red headed opener that was pretty good all played. We took some pretty sweet pictures with the Army Trucks and Tanks! I got up pretty close to Josh then he left and went out into the audience! It was awesome!! We saw some Marines ahhh we miss P! We also saw Christie, Cory's wife one of our good friends also serving with P in Iraq. My favorite pic of the day! Mike looks like a little kid on Christmas morning! Making my way through the crowd to get to JOSH! THERE! WHAT AN AMAZING SHOT!!! He Has Such a Good Voice!! It was a wonderful concert Mike even slow danced with me a little bit in the huge crowd. My favorite song of the night was Unbelievable. It was a truly an unbelievable night!